My friend Connie & I flew into Milan with our backpacks and a gust of whimsy. The plan was to catch a train to Slovenia for a few days and then explore some fine Italian cities. After landing we headed straight to the main train station. Naturally, there was a train strike when we arrived & we were stranded. Stranded in Milan. During fashion week. Whoops. There we were surrounded by very eccentric fashionistas & a large group of angry Russian women. For some reason, they filled the women's restroom and were not inclined to share it. It was the only warm spot in the train station and the Russians had dibs on it apparently. Through some United Nations style negotiating, my friend Connie was able to get us on a train to Venice. Hungry & barely awake we lugged ourselves off the train in Venice and began our hunt for our hotel. It was the Hotel Albergo. It was just after 10pm when we got to Venice and we spent what seemed like days saying, "Scuzi! Dove e Albergo?" The boisterous Italians would flash a smile , point a direction & say a slew of words we couldn't understand. It didn't take us long to realize our mistake. Albergo wasn't the name of our hotel. It was the Italian word for hotel. We wrote it down wrong. Hours we spent going from Albergo to Albergo hoping to find one that had our reservation. Dizzy from wandering around the canals, Connie & I stumbled upon a midnight mass and sat in the back row happy for a rest. Watching a foreign expression of worship in a foreign tongue was quite spectacular. The droning of the prayers and devotion of these faces lit by midnight candles was enchanting. When it was over I was a bit more rested and ready to continue our hunt for the infamous "Albergo". Luckily, or perhaps by divine providence, we found it a few minutes later. The owner's son was attending the front desk of the small hotel. I don't remember his name, but he was possibly the only ugly Italian male we saw during our visit. He had the hots for my friend & proposed every time we entered & left the hotel. Oh, the Italians. To be honest we pretty much spent the entire 10 days lost in Italy. We stalked nuns to the Vatican, had a pair of shoes made by a cobbler we found on the Isle of Capri, we were blessed by the Pope, & stumbled into hidden eateries that the travel channel overlooked by serious error. We stood in the dark & crooked catacombs outside of Rome and watched an elderly nun cry as she explained the story of the Christians forced to hide in there. Our train ride through Tuscany consisted of us and a group of Italian soldiers coming home from basic training. They broke out bottles of wine and sang old Italian songs while the Tuscan countryside passed by out the window. They sat and stared and asked multiple times if they could kiss us. We said no, and they left it at that going back to their singing. Oh, those Italians. None of these activities had been on our To-Do list. Each step of the trip was calculated before we left. I spent $1,000 total on the 10 day trip. Yes, that is INCLUDING airfare. (Just try and beat me on travel deals, I dare you). Despite my best planning efforts, the entire thing was a series of missing trains and getting lost. That's just the way life goes sometimes. 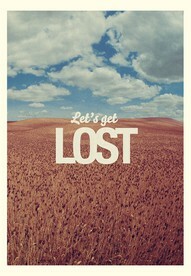 We get lost, away from our planning & calculations. Lost in strange towns with people we had no intention of meeting. You end up heading north instead of south and going when you were supposed to stay. Your 5 year plan for your life got stuck in an old journal and God has created a new route for you to take. Lost in adventures you didn't see coming. We should put down our maps a bit more often & get lost.